Upscale and Custom Barcelona Private Tours Designed to Your Preferences. This Barcelona Driving Tour Includes: Our private Barcelona driving tour includes service of private tour guide, private transportation to sites and to and from your hotel, taxes. This upscale and Barcelona driving tour offers a great introduction to Spain’s most cosmopolitan city, visiting the city’s main sights of interest in a combination of driving and walking to maximize your tour. 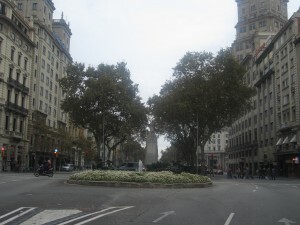 This driving tour of Barcelona’s classic avenues, landmarks and neighborhoods: Plaza Espanya, Palau Nacional and 1929 Expo site, Gran Via, Arc de Triomf, Columbus monument, Arenas and Monumental bullrings. Your expert guide will also take you to Eixample and its pioneering planned districts, and take you to see highlights of Barcelona’s Art Nouveau architecture. This Barcelona driving tour also feature a visit to Passeig de Gràcia, Barcelona’s most elegant avenue, making stops at the Batlló and Milà (Pedrera) houses. These beautiful and strange architectural creations are the handiwork of the modernist architect Antoni Gaudí. Your Barcelona sightseeing tour will also take you Gaudí’s crowning achievementthe stunning Sagrada Familia (Holy Family) Church, whose unfinished façade has come to symbolize Barcelona. This Barcelona driving tour concludes with a view onto the sea, visiting the Olympic port and la Barceloneta district, a former fishermen’s village. You’ll see the harbor from Montjuïc Hill, probably the most spectacular viewpoint in Barcelona.